‘Last Click’ or ‘Direct Conversions’ in organic search (SEO) is a method of attribution that struggles from the same pitfalls that plague its PPC corollary – it is a simplistic view of the consumer journey and, while it may give you some information as to content performance, the information will be badly skewed by its weighting of the value of the last interaction. For this reason, it is necessary to look to assisted conversions to get a better overview of the performance of your various content channels in analytics. It is only through adopting a more holistic approach to rating performance that you can ensure you’re providing the right amounts and the right kinds of content to build on past success. To take action on this information, however, you’ll first need to find it – and you will do that in Google Analytics. Under the ‘Conversions’ heading, you will need to expand the ‘Multi-Channel Functions’ list and then select ‘Assisted Conversions’ which will take you to a standard pivot table and conversions over time display. This page (which can be refined by date as with other Analytics reports) offers up a number of key statistics for determining the success of your various channels – including assisted conversion, obviously, but also ‘last click or direct’ conversions and the value (if attributed) of each. As a ‘for instance’ of the importance of assisted conversions – at Click Consult, we’re lucky to have a very engaged email audience, so a lot of our goal conversions (direct) come from that channel, but without looking a little deeper, it would be easy to disregard it as a channel which assists conversion more than any other – making it and, in this instance, direct traffic important not only as a source of conversions, but as a gateway. While the value (if set) is not always accurate as the same value can be allocated to multiple channels, the assisted conversions value is supposed to indicate the contributory value of a channel, not precise sales figures. Assisted conversions are useful to SEO in a number of ways – not only does it offer an overview of channel performance, but the pivot table offers opportunities to retrieve further data by drilling down. The overview is the obvious place to start as it’s the first report you’ll come to. This pivot table, as mentioned above, gives total numbers and values, but can also be augmented with a number of different dimensions to give you a better overview of what is going on where. The same potential to add secondary dimensions exists in the channel specific tables for each of those listed in the pivot table – and this can give you a great view of where on your site is serving your aims well. Our best performing pages in the direct channel, as you would expect, are those that offer clear routes to conversion (or resource downloads in Click’s case). 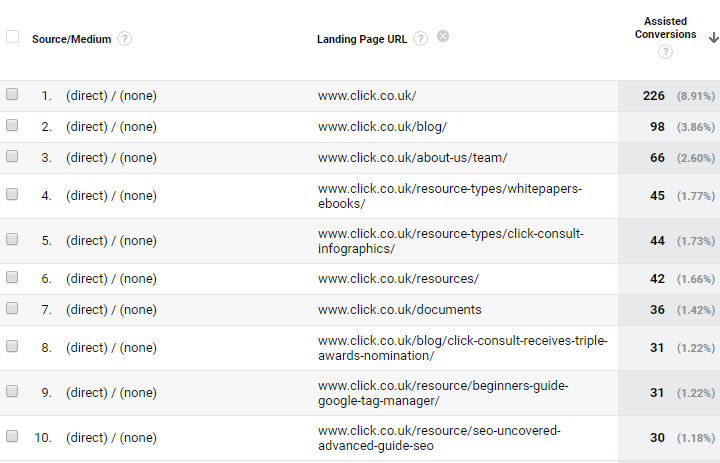 As you follow this table down, however, you can stumble on content or pages that have been overlooked (unless you carry out regular content audits). This exploration can reveal previously unconsidered content opportunities, content which needs updating or can be reworked as infographics or as video or audio. However, if you reverse this table in order of assisted conversions, you can instantly see whether any of your gateway content is failing in its purpose to drive conversions. This can be for a number of reasons – the content isn’t of a high enough quality, substantial or useful enough, or it could lead to deeper problems with your internal linking. The same is true of the other channels, which – with additional dimensions can reveal how your content is performing in relation to your brand’s SEO goals. This includes links in eBooks and other PDF resources (provided tracking codes are in place), content you’ve shared on your social channels and any external sites you’ve appeared on (by selecting referrals). But why use assisted conversions? Experienced users of analytics will know that much of this information can be accessed via other reports – reports which are viewed more regularly – so why look at assisted conversions at all? The short answer is that it is a really useful data point to have when planning various aspects of technical SEO and content planning. 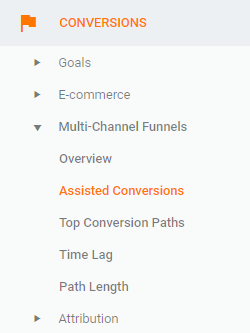 While you can certainly see additional details in conjunction with your channels through reports nested in the ‘Behaviour’ and ‘Acquisition’ menus, the assisted conversions can reveal things which can be overlooked or not looked for at all. In addition to this – a good SEO strategy should not exclude any possible insights and, while we wouldn’t recommend this at the exclusion of your other reviews of Analytics data, we would certainly recommend its addition. To find out more about search marketing, sign up for our newsletter and check out our resources, cheat sheets and infographics. Feel you’ve taken your brand as far as you can? Call us today!